The Lebanese daily al-Akhbar -- which speaks for the “Axis of Resistance” grouping the Syrian regime, Hezbollah and Iran -- concedes today the fierce battle for Qusayr will be long-drawn-out. The Syrian army, backed by hundreds of Lebanese Hezbollah militiamen, has been trying for nearly a week to regain control of Qusayr, a strategic town in Homs province held by rebels for over a year. The town is vital for both the Syrian regime and the Lebanese paramilitary group. The city is a strategic link in the Syrian communications chain, connecting the capital Damascus, Syria's Alawite-dominated coastal highlands, and Hezbollah's heartland in Lebanon's Bekaa Valley. The Lebanese border is only 10 kilometers to the city's west, and the Damascus-Aleppo highway lies to its east. Underlining its importance, the Syrian National Coalition issued an impassioned plea to supporters to send men and weapons to help defend Qusayr, where an estimated 2,000 fighters and as many as 30,000 civilians endured a fourth day of relentless air bombardment and tank shelling by government troops and their Hezbollah allies yesterday. George Sabra, the acting head of the Syrian National Coalition, also called on the international community to establish a humanitarian corridor to help civilians and wounded trapped inside the town. In his news feature for today’s edition of al-Akhbar, journalist Radwan Mortada explains why the battle for Qusayr will be protracted. Everyone inside the town is unsure if better or worse days are ahead. Most of the opposition’s armed rebels entrenched in Qusayr continue to move freely from one hideout to another. Power supplies are cut off, but the rebels use power generators and communications equipment to remain in touch with armed groups outside Qusayr, call in reinforcements, relay news to the media, post videos online of the clashes and bombardments. 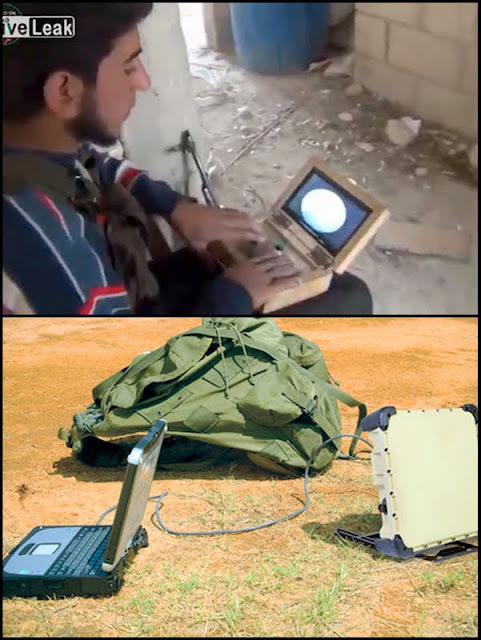 All the rebels’ communications are via Bgan (Broadband Global Area Network) portable satellites connected to laptops or smartphones. Opposition sources tell al-Akhbar the rebels have set up a Military Command in which all heads of brigades fighting in Qusayr are represented. They say Lt. Col. Mohieddeen al-Zein (aka “Abu Arab”) heads the Command. The sources also say the rebels deployed sophisticated “remote-controlled sniper rifles” that use computer screens for monitoring, tracking and targeting. The Prime Minister and Minister of Foreign Affairs of Qatar and the Foreign Ministers of Egypt, France, Germany, Italy, Saudi Arabia, Turkey, U.A.E., U.K., USA and Jordan came together in Amman on May 22nd 2013 to deliberate on the developments in Syria and to reemphasize their support to find a political solution to the crisis in Syria. The representatives from the leadership of the Syrian National Coalition of the Revolutionary and Opposition Forces also attended part of the meeting, and briefed the Ministers on the situation inside Syria. The Ministers reviewed their discussions in the Rome meeting of February 28th 2013, and recalled the joint statement of Istanbul of April 20th 2013 that supports a political solution in Syria on the basis of the Geneva Communiqué of June 30th 2012. The Ministers supported the participation in the Geneva meeting for the purpose of the full implementation of the outcomes of the first Geneva meeting to end the bloodshed, fulfill the legitimate aspirations of the Syrian people, preserve the territorial integrity of the country, and strengthen the national unity amongst all components of the Syrian national fabric. The Ministers emphasized the central role of the United Nations Security Council in the realization of this effort. The Ministers condemned in the strongest terms the use of heavy weapons including ballistic missiles against the people, and deplored the ethnic cleansing that the regime is pursuing as seen recently in Banias, and declared that such crimes will not go unpunished. The Ministers stressed that the political process to reflect positively and tangibly on the daily lives of the Syrian civilian population, including the release of prisoners, the delivery of humanitarian assistance and end the killing of civilians. The Ministers identified as the corner stone of a political solution the formation of a transitional governing body through mutual consent, within a defined and agreed upon timeframe, to assume full executive authority, including all powers of the Presidency in addition to control over the armed forces and the security and intelligence apparatuses, for an agreed upon and defined timeframe for the transitional period. The Ministers affirmed that the final objective of the transitional period should include the adoption of a new Syrian constitution that guarantees the equal rights of all citizens. The Ministers underlined that the attainment of the political solution that meets the aspirations of the Syrian people means, as stated in the Abu Dhabi joint statement of the May 13th 2013, that Assad, his regime, and his close associates with blood on their hands cannot play any role in the future of Syria. The Ministers reiterated their support to the Syrian National Coalition of the Revolutionary and Opposition Forces and welcomed the efforts by the Coalition to expand their base of representation to include all components of Syrian society, and emphasized the central and leading role of the Coalition in the opposition delegation to the anticipated international conference on Syria. Furthermore, the Ministers reiterated the right to self-defense of the Syrian people, and committed to offer additional support to reinforce the role and capacity of the Supreme Military Council (SMC). 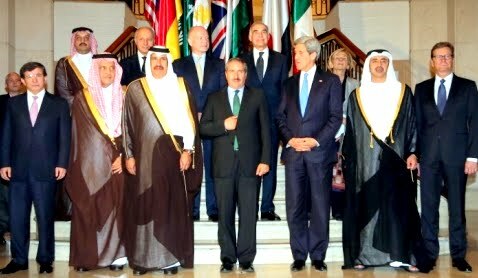 The Ministers expressed their strong concern over the increasing presence and growing radicalism on both sides of the conflict and terrorist elements in Syria; a matter that deepens the concerns for the future of Syria, threatens the security of neighboring countries and risks destabilizing the wider region and the world. The Ministers denounced the intervention of foreign combatants fighting on behalf of the regime, and consider their presence a flagrant intervention on Syrian territory and a serious threat to regional stability. In this context, the Ministers stressed in particular the operations conducted by Hezbollah in Qusayr and elsewhere and called for the immediate withdrawal of Hezbollah, fighters from Iran, and other regime allied foreign fighters from Syrian territory. The Ministers expressed their deep concern over the deteriorating humanitarian conditions in Syria, as well as the threat they pose to the stability and security of neighboring countries hosting Syrian refugees. They underlined the importance of cross border humanitarian operations and called upon the international community to support host countries to address the pressures arising from hosting refugees based on the principles of burden sharing and to prevent any implications for international peace and security. The Ministers viewed with extreme concern the growing number of reports and strong indications of the use of chemical weapons by the regime in Syria. The Ministers emphasized the importance of enabling the UN to conduct a comprehensive investigation regarding the use of such weapons. The Ministers stressed that there will be severe consequences if these reports are confirmed. The Ministers also emphasized that until such time as the Geneva meeting produces a transitional government, they will further increase their support for the opposition and take all other steps as necessary. Finally, the Ministers agreed to strengthen cooperation and coordination among themselves and with international partners to ensure the successful convening of the international conference leading to a political solution to the Syrian crisis.